Baltimore, MD - Feb. 10, 2019 - On Sunday, January 27, Bais Hamedrash and Mesivta of Baltimore marked the first yahrzeit of the Rosh Hayeshiva, Harav Zvi Dov Slanger, zt"l, with a Kinnus Zikaron, which took place in its beautiful new Bais Hamedrash. Local Rabbonim and members of the Baltimore community joined the Hanhalah and talmidim of the yeshiva as over 500 people gathered to hear divrei zikaron about Rav Slanger, zt'l who passed away suddenly one year ago. Speakers included Harav Aaron Feldman, shlit"a, Rosh Yeshiva, Ner Yisroel of Baltimore; Harav Shmuel Kamenetsky, shlit'a, Rosh Yeshiva, Philadelphia Yeshiva; Harav Moshe Heinemann, Rav , Agudas Yisroel of Baltimore; Harav Elyasaf Slanger, Shlit"a, Menahel, Bais Hamedrash and Mesivta of Baltimore; and Harav Chaim Cohen, shlit"a, Rosh Yeshiva, Bais Hamedrash and Mesivta of Baltimore. Rabbi Hillel Tendler, a talmid of the Rosh Yeshiva, zt"l, and close friend of the yeshiva, emceed the event.. 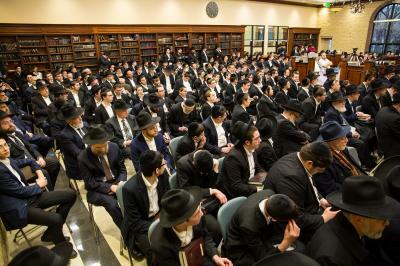 The kinnus followed a yahrzeit seudah and siyum held in the yeshiva dining room, as well as the hakamas matzeivah at the Agudath Israel cemetery, both held earlier in the day.